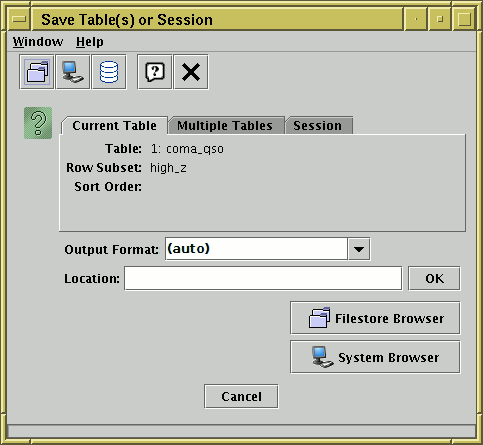 The Save Window is used to write tables out, and it is accessed using the Save Table button ( ) in the Control Window's toolbar or File menu. The window consists of two parts. At the top is the Content Panel, which is used to determine exactly what table or tables are going to be saved, and below it is the Destination Panel, which is used to determine where they will be saved to. These panels are described separately in the subsections below. For large tables, a progress bar will be displayed indicating how near the save is to completion. It is not advisable to edit tables which are being saved during a save operation. In some cases, saving the table to a file with the same name as it was loaded from can cause problems (e.g. an application crash which loses the data unrecoverably). In other cases, it's perfectly OK. The main case in which it's problematic is when editing an uncompressed FITS binary table on disk. TOPCAT will attempt to warn you if it thinks you are doing something which could lead to trouble; ignore this at your own risk. If you save a table to a format other than the one from which it was loaded, or if some new kinds of metadata have been added, it may not be possible to express all the data and metadata from the table in the new format. Some message to this effect may be output in such cases. There is no option to compress files on output. You can of course compress them yourself once they have been written, but note that this is not usually a good idea for FITS files, since it makes them much slower to read (for TOPCAT at least).